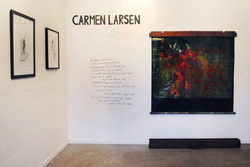 Carmen Larsen is a Vancouver based Artist working in a variety of mediums including painting, drawing, photography, jewellery, and writing. Her studio is based out of Gam Gallery & Studios. Carmen's work is driven by her obsession with philosophy, ancient studies, symbolism, mysticism, metaphysics, space and time, presentism and eternalism, the firmament or space between, relativity of simultaneity, abstraction, transformation and rebirth or recylcing of objects. Studio visits are welcome. Please email me to set up a time.